helping leading brands drive rapid, profitable growth on Amazon and beyond. Amazon has changed the world and created new challenges and opportunities for brands. In order for brands to compete in this new world, they must have a successful Amazon strategy. We are Amazon experts that leverage our ecommerce and inventory management experience, product and customer data analytics and brand-centric approach to help our client brands drive sustainable growth and master the Amazon marketplace. MAP (Minimum Advertised Price) brands that currently sell on Amazon to drive incremental revenue while improving control over their brand and pricing. MAP brands that are new to Amazon to create an effective go-to market strategy. Unlike the digital agency model, Tall Ridge operates as a “sales certain” full-service authorized retail partner, financially committing to our partnership by purchasing and warehousing inventory for our brands. 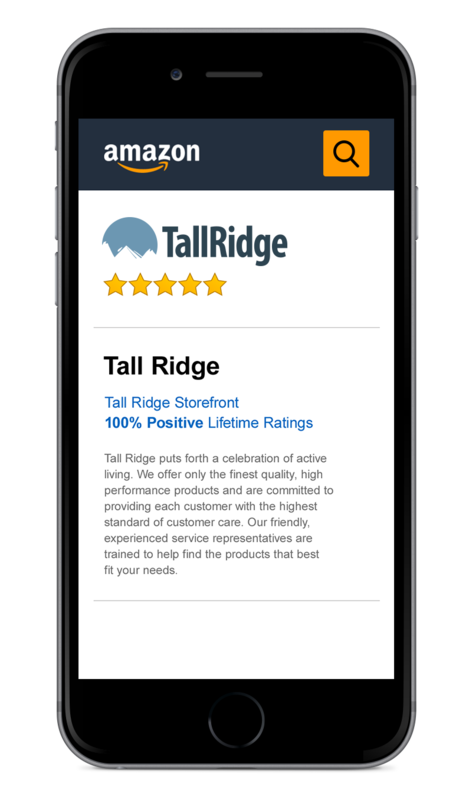 Tall Ridge earns revenue from our client brands through the sale of their products on Amazon and other marketplaces. With a 100% positive lifetime seller rating, we take customer satisfaction very seriously. Take a look at some of our five star reviews. Your dedicated Tall Ridge account team will guide you along every step of our process that is proven to produce results. We thoroughly vet each partnership to understand your program goals and ensure mutual financial viability. We purchase, prepare, and ship your inventory from our fulfillment center in Chicago, IL to Amazon FBA locations nationwide. In parallel, we train our customer service to know your products inside and out. We’ll review your current Amazon brand presence and develop A+ product content according to your brand guidelines, focused on maximizing search rankings and conversion. Removing unauthorized sellers is key to achieving revenue growth, pricing stability and brand control on Amazon. We work with you to identify and remove rogue sellers. Our team creates and executes a marketing strategy focused on driving sales growth, market share expansion and greater brand promotion. We deep dive into the data to provide rich program, brand, product, customer, and competitor insights, allowing for continual program optimization. When it comes to producing results, our clients expect great things and Tall Ridge delivers. Here’s what you should expect when working with us. Optimized, brand-focused, product pages for a best-in-class customer experience. Increased conversion, expanded market share, better marketing ROI and incremental sales growth. Stable, MAP compliant pricing protecting your margins while avoiding “race-to-the-bottom” pricing. KNOWLEDGE, EXPERIENCE & FRESH IDEAS. Meet our team of talented, experienced individuals that are connected by a common purpose: to help our client brands maximize their results on Amazon and other online marketplaces. We are committed to providing each customer with the highest standard of customer care. Our friendly service representatives are experienced and trained to assist you. Please give us a call or send an email. Located just 20 miles north of downtown Chicago. Located within the TechNexus space, inside the Lyric Opera building, downtown Chicago.